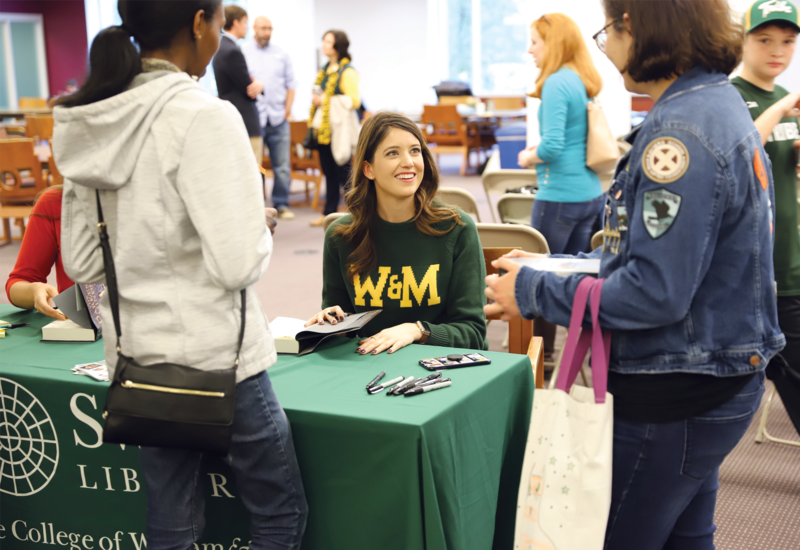 A Welcome Return: Alexandra Bracken ’09 held a lecture and book signing in October during Homecoming & Reunion Weekend. Over the course of four years, Alexandra Bracken ’09 woke up every morning at 6 a.m., went into the Barrett Hall study room, feasted on her daily breakfast of a bag of Cheez-Its and Coca-Cola, and worked on her novel. While other freshmen were staying up late studying and waking up just in time for their 10 a.m. class, at 18 years old, Bracken had committed to writing a book. More than a decade since Bracken first started writing, she has published 11 novels, including The New York Times children’s series best-seller, “The Darkest Minds.” Bracken came back to William & Mary during Homecoming & Reunion Weekend this past October and held a lecture at the Earl Gregg Swem Library about her experience writing this top-selling book and her time at William & Mary, and gave advice to aspiring young authors. “The Darkest Minds” follows the life of Ruby, who wakes up on her 10th birthday with powers that change the course of her life. This young adult novel rose to the top of the best-seller list, and it was quickly picked up by 20th Century Fox and was made into a movie in August 2018. While it seems like Bracken’s rise to fame was sudden, it was due to many years of hard work. When Bracken started writing her first book during her time at William & Mary, her young age never felt like a limitation for her high aspirations. Instead it was a motivation. Once Bracken completed her first book, she thought she’d get an agent, submit the book to an editor, and get the book published in a flash. While Bracken was constantly rejected, she never gave up. Her biggest advice to any aspiring author: learn to love rejection. “Your whole career, you will be rejected by agents, by authors and by readers who don’t like your work. It’s one long series of rejection, and you have to learn not to internalize it,” she says. Despite setbacks, Bracken knew she was meant to be a writer. When she started writing “The Darkest Minds,” she knew the success of the book was dependent on one thing: her love of the story. Once “The Darkest Minds” was released, it was a turning point in Bracken’s life. The book rose to the top of the charts, and she knew that all the risks she had taken had paid off. “It took me five years to save up enough money to be able to write full-time and feel comfortable doing that, but once it was released, it took off,” Bracken says. “It got turned into a movie and a satellite tour. During her speech in Swem, Bracken drew on her own experience, advising aspiring authors to just start.